To LET, on LEASE, erected as a pioneer to the settlement of a populous neighbourhood. The whole paddock adjoining is surveyed, with plans for sale in allotments at a low price with deferred payments. The new market contiguous is fenced. The great and increasing traffic of Smith-street, with the numerous employees at the gasworks, give assurance for the establishment of a good business within a short period. 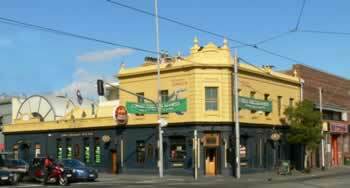 The promised trade may not have eventuated, as there was a rapid turnover of publicans in the first few years. James Lawlor, James Crawley, and George Pashley followed one another in quick succession, while by August 1865 Mater and Co were again advertising it to let. By 1869 it was bought by Richard Benham who was also the licensee; it remained in Benham family ownership into the twentieth century. The hotel is stuccoed stone and brick. The corner splay is emphasized with quoins and pilasters. After some years' flirtation with Irish-themed names, the hotel has recently returned to its original name.